Prosthesis Specialist - UABC (Mexico). 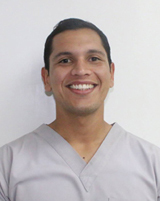 Diplomate in Dental Aesthetics - UABC (Mexico). Master Course in Vita Theoretical and Practical in Porcelain over Zirconia and Spinelli Infrastructures Mounts. Course in Basic Porcelains with Ceramco 3®. Course in Indirect restorations with in-joy. Inductive Course to Laboratory and Prosthodontics Clinic.